When you have limited space but would still love the comfort and appeal of a recliner, then a small or even better NARROW Recliner style is one of your best options. This design can come in any style, type, upholstery material or even color that you can think of, which will enhance your home, provide superb comfort, an all without taking up too much space. The NARROW recliner is basically the same concept as the small Recliner. But, rather than being compact in size, this Recliner still has some length, but rather a more slender shape. 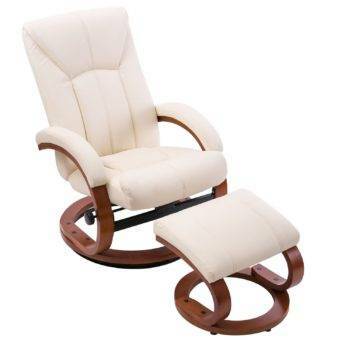 The Zero Gravity recliner is one of the most comfortable and Healthy recliners that you will find. This is because it can recline in positions which provide maximum comfort and the least amount of stress on your entire body. Some models of Fold Out Armchairs, has a very Narrow and slim shape and are likewise compact. Thus, it will save you on space, while providing luxurious comfort. 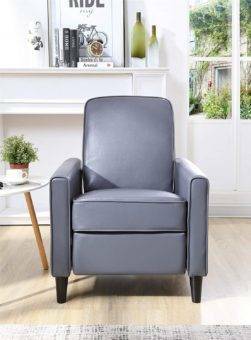 The Traditional Contemporary Modern style recliner does boast a Slender, and simplistic shape with a small design, ideal for fitting in smaller spaces. Most Plush cushioned recliners are oversized and large, although every once and a while you will find one with a more Narrow and slim shape. 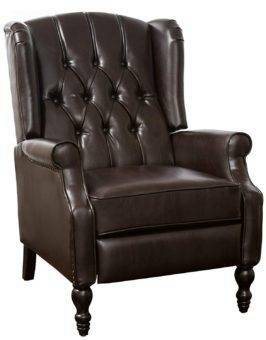 The Elizabethan Style recliner is Slim and compact, with all the functionalities of a comfortable recliner, along with a tall back and decorative detail. 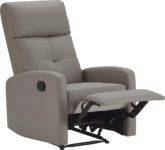 Looking for your most Narrow option and most Space Saving, Recliner. A reclining office chair with the addition of a footrest can be just as comfortable as any Recliner, plus it usually comes with gliding and rotation functions. Some recliner Styles come with a separate Ottoman, which is likewise, space efficient. Some of these models offer a more Slender Framework, along with all the other comfort features that a recliner should have. As with any other recliner type, you should consider quality, look for a sturdy wood or metal frame, and durable upholstery that is well stitched together.Recline mechanisms and all other functionalities need to work properly and be easy to operate. A Narrow Recliner will feature a Slim and elongated shape, sometimes with a higher back, and the addition of a retractable footrest. The Henderson from Truly Home is a classic contemporary and modern styled leather Recliner in a light grey color with a slim and small design, that will look neat and sophisticated in small spaces. The retractable footrest, allows you to put your feet up after a long and strenuous day. The headrest I pillowed for additional comfort and support with gorgeous tufting detail for a modern design statement. The arms are slim and gently curved, with padding for more comfort. A light grey leather upholstery that is durable and very easy to clean. Comes with full assembly instructions that are super easy to follow and quick assembly. A plush cushioned and stunning leather piece from Charles Ashton’s Home Collection. 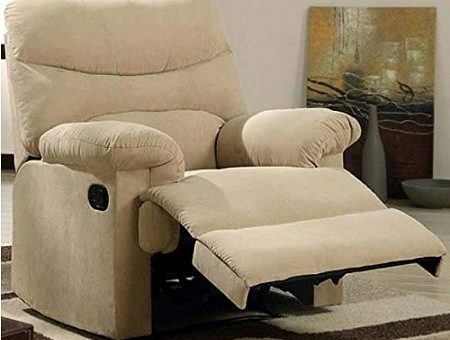 This small and Narrow Powerlifting recliner is the perfect addition for individuals who struggle with mobility or for older people, and most of all, it takes up very little space in your home. The forward tilt and lifting function allows for much easier and more efficient access. Remote controlled for further convenience. The Backrest is fully removable allowing you to easily clear the chair through narrow doorways and hallways during installation. Available in four rich , neutral, color leather options that will blend superbly with any background decor and home style. Something a little more fun and decorative from JC Home, the Menet is a Swivel Glide recliner in a patterned grey and white print, for a bit more decorative detail. 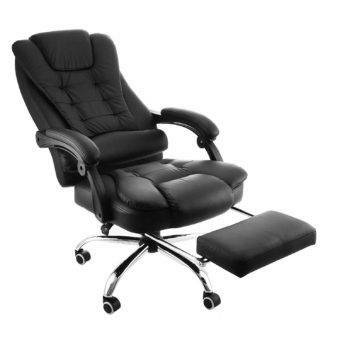 Compact and narrow in size with two highly functional and smooth, recline positions. A durable and strong Steel base with 360-degree swivel function, and a quiet gliding mechanism. Fabric upholstery from Sofat and durable RAYON, with a grey and white pattern print. The seat is cushioned with individually wrapped, drop-in pocket coils and foam, for strength and comfort, with a padded most backer and armrests. The back seat offers enhanced neck support with its additional height. Warm and inviting, that is what the ACME Arcadia in soft and luxury Microfiber, with extra padded cushioning, conveys to me. In a rich Chocolate or light Beige color option, you can make the perfect Neutral choice for your home. Narrow and small in size, while still very attractive and comfortable, ideal for use in smaller rooms and areas. A sturdy Hardwood frame and armrests, and side knob for lowering and lifting the footrest. Microfiber upholstery,that is very soft an durable, while being water repellent and stain resistant, and excellent fabric choice for recliner upholstery. Easy to assemble and comes with full instructions. For the Vintage Styled Home, this an exquisite and timeless piece with the full functions of a recliner, available and some attractive color options, in both leather or fabric upholstery, to choose from. Very easy recline,simply push back into your favorite recline position. A comfortable and easy to operate footrest to rest your feet on. Elizabethan Vintage style, with tufted back and button details. The higher back provides excellent back and spine support while appearing more sophisticated and classy. The seat is, comfortably cushioned, with firm padding and the armrests are a convenient shape and design. Very Sturdy Legs, made from durable BIRCH WOOD, that will hold up easily under pressure. 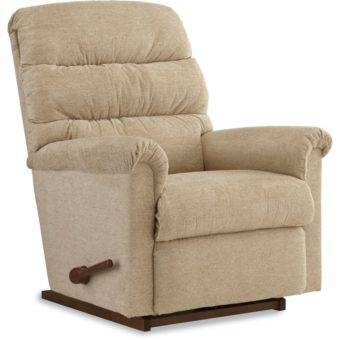 Very narrow, small and easy going is what the Berri Swivel Recliner is. A small yet comfortable and cozy shape with a retractable footrest and full recline feature. Ideal to use in a small room, office or even bedroom where space is very limited. Upholstered in stain resistant, neutral beige leather. Strong and durable metal frame, that will stand the test of time. Black finishing that blends well with the Beige upholstery. Some assembly required, but easy instructions are provided. These are some excellent choices in small and Narrow recliners when you are limited on space but still, need something cozy and comfortable. Keep in mind that lighter colors in upholstery, as well as background décor, has the explicit advantage of making any space look larger and wider, with a more open feeling.